Conservation of nature is the top priority of Bhutan’s government. It is strongly integrated into the country’s unique development philosophy, Gross National Happiness (GNH). With 60% of its area under forest cover and more than 50% of it designated as protected areas, Bhutan has been hugely successful in conserving nature. Its success has been acclaimed by the world. However, there are trade-offs between conservation and livelihoods for rural farmers. Every year, farmers lose crops and domestic animals to wildlife, threatening their livelihoods. Farming in Bhutan is largely subsistence: a little damage can be devastating. My research, which began in May 2014, is examining the cost effectiveness of different mitigation measures used by farmers to protect their crops against wildlife. This study was conducted in Bartsham, one of the sub-districts in eastern Bhutan. Farmers understand the importance of wildlife conservation but question its extent. As one of the farmers during my study in the Bartsham, Trashigang asked, “Who is more important, wildlife or humans? Farmers toil day and night to protect their fields from wildlife damage. The animals that cause the most problems to farmers are wild pig, monkeys, deer, porcupines and elephants. Recently, people have started using lethal electric fences with enough voltage to kill an elephant, let alone a human. 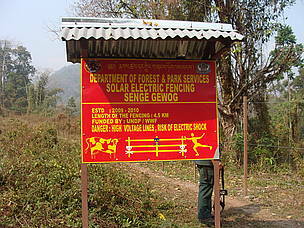 As of August 2013, eight people were electrocuted by lethal electric fence in Bidung, Bartsham and Samkhar gewogs under Trashigang district (kuenselonline.com). The government’s solution has been to install low-voltage, safer electric or solar fences in some communities. More recently, the government announced it has decided to install electric fences throughout the country as a gift to farmers. But is this sustainable? Is this the magic wand that will solve the problem? There are lots of practical issues that government needs to think of: for example, community cooperation, maintenance, rugged topography and dispersed settlements, less working population and so on. Moreover, it is not possible to install electric fences in each and every village, so how does the government prioritize? Considering all those constraints, it is difficult to see how the problem will be resolved soon without additional ideas. Sure, the government can help communities install safer electric fences, but there should be many other alternatives. The alternatives need not cost the Earth. Relaxing hunting regulations, for example, could ease pressure on farmers as long as it is done sensitively too conservation efforts. The preliminary findings from our study also indicate that government initiated low voltage electric fences are the most cost effective ways to protect crops against wildlife. But, as mentioned above, government should consider all the ground realities before it scale up to the national level.